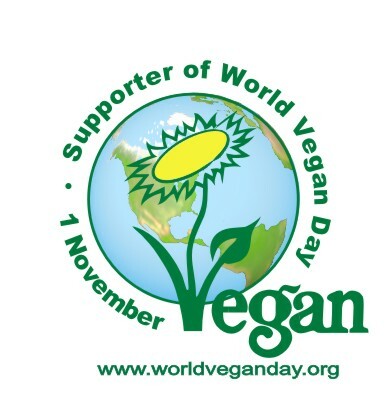 And November is Vegan Month! For my November Art Challenge, I've decided to take a photo a day. I really had a hard time trying to figure out what I wanted to do. I wanted to continue with the Art By The Inch tradition, but I knew I would not be able to draw every day because of the soul destroying nature of my current day job. I thought about drawing every day. Or blogging every day. Or some sketches every day. Or some digital art with my poor ignored graphics tablet, every day. All these things are just too challenging, with my current situation. But I still wanted Something to show for the month. Especially since I have not done ANY art projects this year. After I did the sunday photo entry this past weekend, everything clicked into place. The digital camera is new; I need to learn all the settings. It takes just a few minutes to take a few photos and I don't have to edit them or upload them if I don't have time. And, most importantly, it makes me happy. So. Here's the Day One photo! That's the space I live in. :) Tegan is sitting where I usually sit. I just noticed it's not terribly tidy. ha. two coffee mugs. yeah, I only drink out of one, but they tend to gather because I'm lazy about taking the crockery back to the kitchen. yes, I sit on two pillows. on the floor. I hate furniture! It's not environmental. and I don't have room for it. and Tegan has easy access to my lap (aka the area of treats). under the monitor is a stack of books. The red book is my dictionary which I consult on a regular basis. middle, extreme left of photo is my favorite photo of SO and me, kissing in front of the "black" mailbox just off the Extraterrestrial Highway. 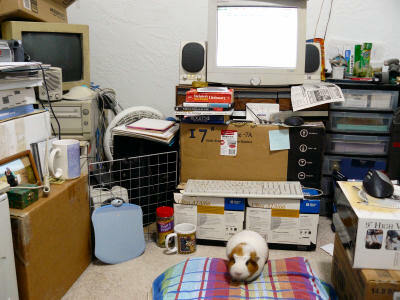 the two computers, Tiny and Temperamental, are networked (along with SO's computer). Temperamental is on the left, Tiny is the front computer that I live on.